Welcome to the Mindful Education Online Training. Join our comprehensive online training for mindful educators, administrators, and schools. For educators, mindfulness can decrease burnout and foster wellbeing. When taught to students, mindfulness supports more relaxed and regulated learners. Mindfulness supports the development of kindness and understanding while limiting bias and assumptions. Mindfulness supports happiness and emotional balance for both educators and students while developing resilience to the numerous pressures of life. Train with experts in the mindfulness and social and emotional learning fields and learn best practices for sharing these lessons with students and colleagues. Mindfulness strengthens attention and limits distractibility, helping us stay attuned to what is happening in the present moment and building productivity. Join an inspiring community of fellow educators committed to compassionate teaching. Research shows that students and teachers in school systems that have adopted mindfulness are happier, more focused, more compassionate, emotionally regulated, and less impacted by stress. When teachers develop their own capacity for stress-reduction, attention, and emotional balance, positive change follows in the classroom. 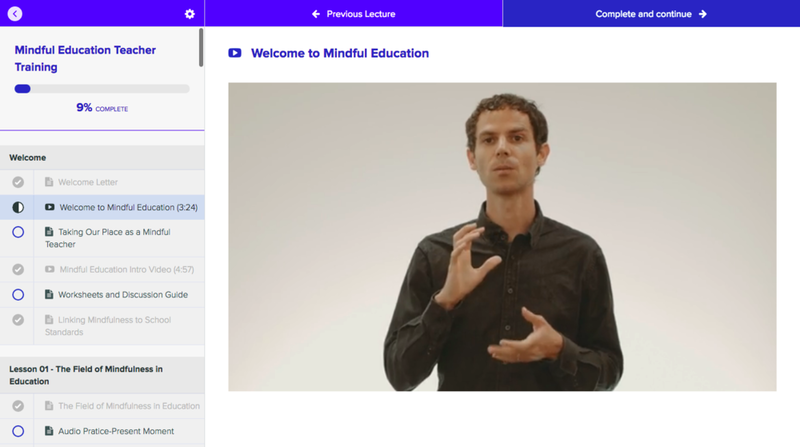 Therefore, The Mindful Education Online Training begins with audio, video, worksheets, and live webinar trainings for adults to develop their own mindfulness and emotional intelligence. Our teachers report less burn-out, greater job satisfaction, and that they connect better with their students. In this full curriculum training you will learn the many benefits of mindfulness in education and the most effective ways of teaching it. Gain the competence to integrate mindfulness and social and emotional learning lessons into daily work with youth. Gain expertise from videos, webinars, and worksheets from leaders in the mindfulness and SEL fields. Learn fun and easy ways to introduce students to mindfulness. This program teaches how to integrate mindfulness into existing lesson plans and administrative systems. Learn how even a few minutes per day, incorporated into class routines and curriculum, can make a substantial difference in students’ wellbeing and academic success. As a multimedia training platform, Mindful Education gives the foundational skills and diverse tools that you can adapt to your students’ needs and your teaching environment. Experts and Leading Researchers from across disciplines help you to develop your practice and hone your craft. Daniel Rechtschaffen, Marriage and Family Therapist, is the author of The Way of Mindful Education and The Mindful Education Workbook. He is the founding director of Mindful Education. Linda is the author of Building Emotional Intelligence. She is the Director of The Inner Resilience Program and a co-founder of the Collaborative for Academic, Social and Emotional Learning (CASEL). Daniel is the author of many books including The Mindful Brain, The Whole-Brain Child, and Brainstorm. He is the Executive Director of the Mindsight Institute and a clinical professor of psychiatry at the UCLA. Susan is author of The Mindful Child. She is the cofounder of the Inner Kids mindful awareness program for children, teens and their families and she consults with various schools and organizations. PLUS: $390 WORTH OF BONUS MATERIAL! 10 Podcast Interviews with mindfulness and education experts such as JusTme, David Treleaven, Caverly Morgan, Andres Gonzales, and more. Teaching to Different populations with Morris Ervin, Jr.
“I have had my own mindfulness practice for 5 years and have been searching for a mentor to help me transfer my knowledge into classrooms. Of all the endless hours of research I have done, Daniel's methodology with Mindful Education and the five literacies appealed to me the most. Daniel was also very attentive and willing to assist me in any way as I began the journey. It has been an extremely worthwhile endeavor and I have encouraged many of my colleagues to sign on."